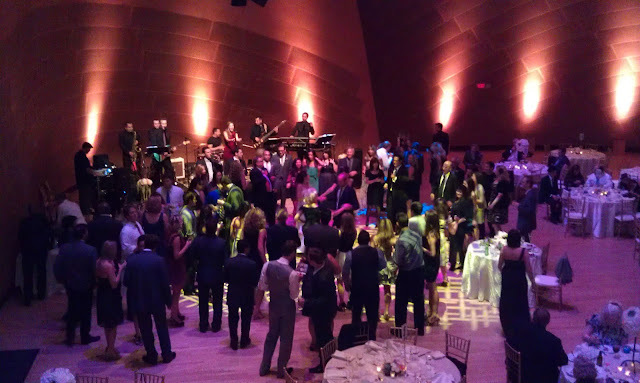 What can you say about the Walt Disney Concert Hall? They reception room had so much attitude! 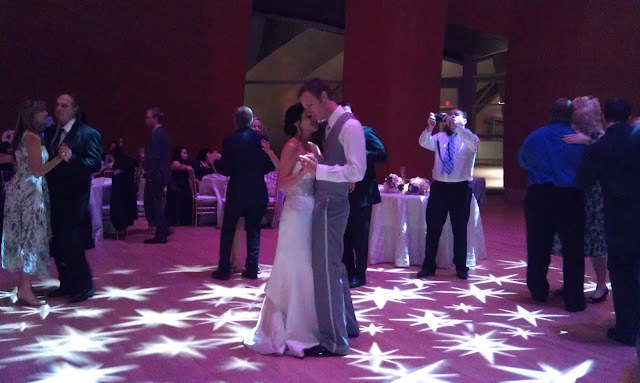 The lighting hitting the beautiful wood panel walls and splashes of patterns on the dance floor, it was breath taking! This couple is well on their way to happily ever after! My husband Bryan and I recently got married and really wanted a top notch band. The full retail rate was tough to deal with most bands and George at Undercover Live really helped us on the price. The band was really amazing. We had a pretty awesome cover band the night before at our wedding so we were nervous that we either over paid for the wedding or the band wouldn’t be as good — that was all put to rest as soon as they played our first dance song. They learned a difficult Annie Sellick bi-lingual jazz version of Nature Boy that was absolutely flawless. From there, they made the party. We did a 7 piece band which is so important because you need the horns. 9 would be better if you can afford it. The entire team was so professional and accommodating and the music and showmanship was out of this world. Designed by architect Frank Gehry, Walt Disney Concert Hall, new home of the Los Angeles Philharmonic, is designed to be one of the most acoustically sophisticated concert halls in the world, providing both visual and aural intimacy for an unparalleled musical experience. Through the vision and generosity of Lillian Disney, the Disney family, and many other individual and corporate donors, the city will enjoy one of the finest concert halls in the world, as well as an internationally recognized architectural landmark. From the stainless steel curves of its striking exterior to the state-of-the-art acoustics of the hardwood-paneled main auditorium, the 3.6-acre complex embodies the unique energy and creative spirit of the city of Los Angeles and its orchestra. Get the latest Undercover news, events and special offers. Enter your email address below and submit. Your privacy is protected!